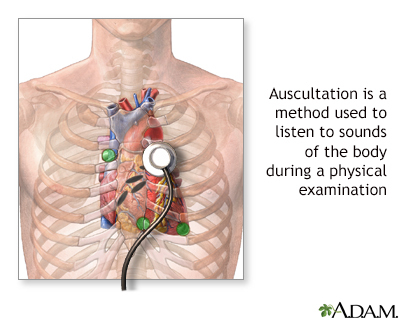 Auscultation is listening to the sounds of the body during a physical examination. Providers also use auscultation to listen to the heart sounds of unborn infants. This can be done with a stethoscope or with sound waves (called Doppler ultrasound). Auscultation can also be used to hear pulses in the arms and legs. Swartz MH. The physical examination. In: Swartz MH, ed. Textbook of Physical Diagnosis: History and Examination. 7th ed. Philadelphia, PA: Elsevier Saunders; 2014:chap 4. Auscultation is a method used to listen to the sounds of the body during a physical examination by using a stethoscope. A patient's lungs, heart, and intestines are the most common organs heard during auscultation.